Gender equity is easily supported in theory but harder to pursue in practice. 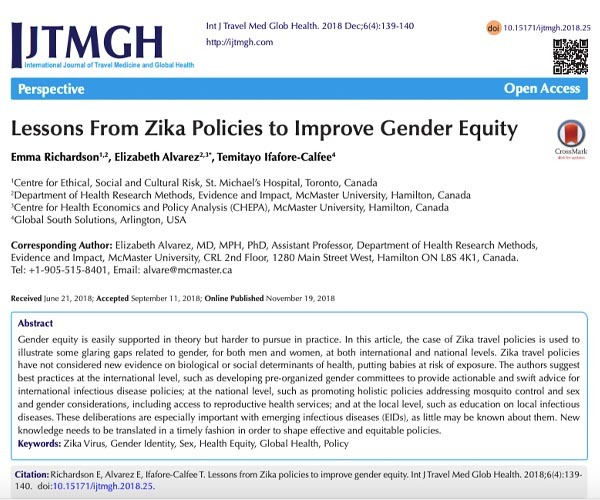 In this article, published in the International Journal of Travel Medicine and Global Health, the case of Zika travel policies is used to illustrate some glaring gaps related to gender, for both men and women, at both international and national levels. The authors suggest best practices at the international level, such as developing pre-organized gender committees to provide actionable and swift advice for international infectious disease policies.